– After our 34 year old Adler Barbour compressor wouldn’t start, we decided to replace it. We installed an Isotherm 3701, which has a holding plate and a so-called smart controller (what Isotherm calls ASU technology). We find it to be an extremely DUMB controller because it cannot even keep a small freezer space frozen. It certainly does not behave as they state on the marketing literature. We’ve been talking to tech support, who first insisted we were not able to use the holding plate in a box with a partition to create a freezer/fridge combo. When I pointed out their literature says it is possible, we were then told to change the DIP switch settings and alter the composition of the anti-freeze/ water “eutectic” solution to avoid cracking the holding plate. WOW! We watched its behavior closely over the summer, and only had acceptable performance once Van installed a small muffin fan on a separate temperature controller that turns the fan on once the fridge box reached too high a temperature and left it on until the fridge box reached its set point. We had to keep the ASU controller in Manual and control the compressor run time with the temperature dial. The ‘smart controller’ remained very dumb no matter what we did.BTW, the installation of the unit was OK, but it was sent without sufficient coolant in the compressor, so we had to get a local fridge tech to come top up the charge to get the holding plate to function properly. All in all, I would not recommend this unit, though the Danfoss compressor is very nice, small and runs quiet. – Increased insulation around fridge; the goal was to improve the fridge performance. We had already put blue foam inside, this time we added insulation to the outside since we had to take apart the port cabinet to install the holding plate. – Finished the solent stay installation by adding a Dyneema Dux forward stay and a custom made plate that allows Van to rig the stay using the bollard and stem fitting. – Purchased from Crusader Sails (a UK sailmaker) a hank-on Drifter for use on our new solent stay, and a Mizzen Stays’l . The Mizzen Stays’l turned out to be a great way to get up a lot of sail area in light airs, with much easier handling then a spinnaker. 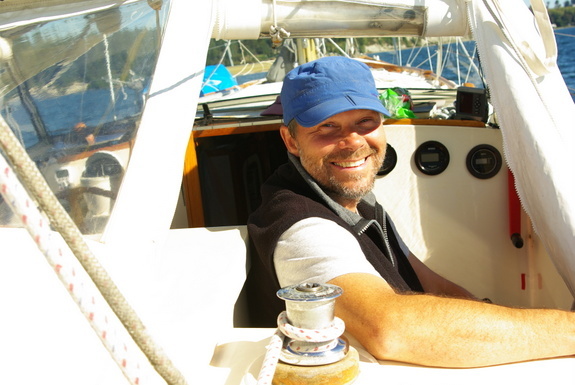 The Drifter will be especially nice once we put a working jib on the headsail furler, rather than our current genoa. Crusader forgot to add the hanks on the sail, so thanks to Ballard sails for adding them on short notice and to Crusader for paying for the work without hassle. – Replaced the fresh water pump with a Shurflo Aqua King Junior. The existing pump was not broken, but we decided having a spare on board was a good idea. We installed a new one and kept the original as a spare. – Replaced the manual bilge pump with a new Whale Henderson Mk V universal pump because the original had failed. Also replaced the failed gate valve with a new 1 1/2 inch Marelon flange base seacock, and replaced the still functioning original bronze manifold with Marelon fittings. (We had the original bronze manifold for the galley fail, so in our minds all of them are suspect.) Replaced the original green bilge hose with below-waterline quality Trident hose. – Added a 2” thick, 4 pound visco elastic memory foam topper to the V-berth bed, which improve its comfort dramatically. Thanks to Amazon for the quick shipping. – Removed the heater ducting from the main salon to the v-berth since we always kept the v-berth vent closed anyway. Removing the ducting improved the air flow rate from the Webasto heater. – Replaced the raw water pump cover because the original on the Sherwood G65 water pump was very worn. Purchased from Tri-County Diesel in Bellingham. – Replaced the alternator with 100amp Prestolite model 8MR2069TA, which is a metric sized alternator. The original 60 Amp alternator was working fine, but we thought it prudent to have a spare onboard, so we kept the original as the spare. It’s very nice to have the 100 Amp capacity when running the windlass or if the batteries are badly depleted. – Installed thermocouple on the alternator that feeds temperature data to the Xantrex smart charger, which should help prolong the life of the alternator. – Pulled out the on-board sewing machine and made some important improvements, including adding a new zipper to the cockpit canvas so the deck hand has more comfortable headroom at his chair (see photo above); made a new rain catcher tarp; made a fuel can cover, which required now that we keep the gas fuel can on the aft deck; made a jib halyard bag, because most of the halyard sits on the deck all summer since the sail is on a roller furler. – Redid the Teakguard on the teak deck trim for the 3rd year. This coating is very easy to renew, but it requires renewing each year. I like it better than the varnish. – Replaced the failed wooden bracket on the outboard motor mount with a piece of the 1 1/8” plywood leftover from our home roof repair. 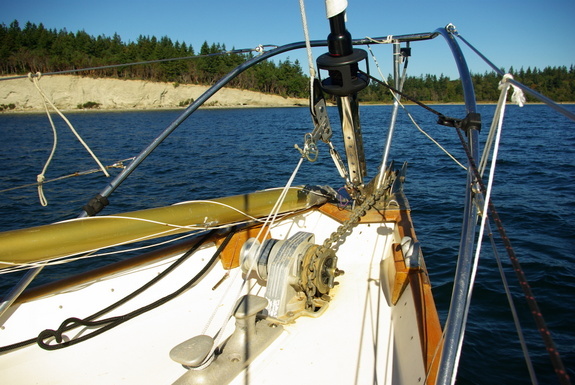 – replace corroded cotter pins on mast, which had turned to dust over winter. I guess those cotter pins installed last fall were not stainless steel after all. Good thing Van does a close mast inspection each year. – sadly our original tachometer broke during the summer so have to decide whether to replace or repair. 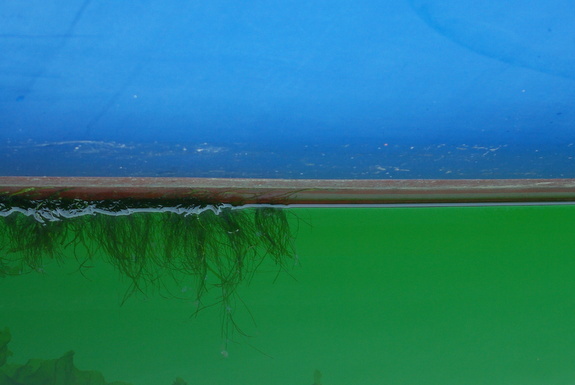 – our bottom paint job from Sea Marine was not so good (see photo below). She is showing an ample beard in only certain areas, so the paint application was not good. Mark at Sea Marine told us to bring it back spring 2015 and they will make it right. 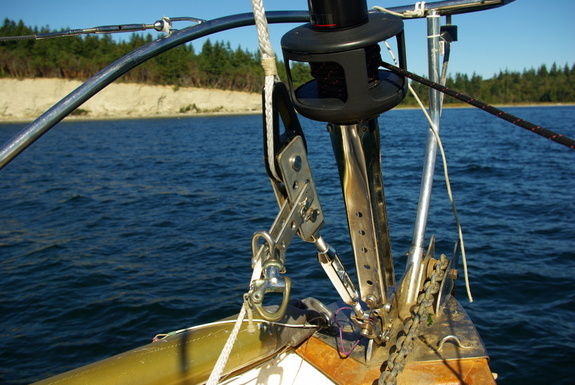 Capt’n Van had a clever way to attach the solent stay without modifying the deck hardware. Notice how the growth is only is some areas, while the adjacent area is clean. This beard grew while we were sailing about 800 miles in 2 months. The bottom was painted less than a year earlier.